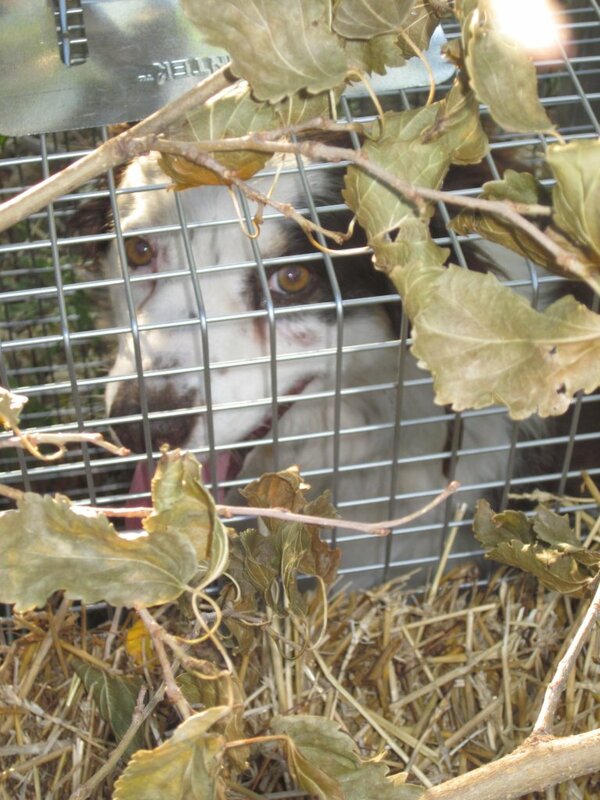 After we set up the very very very large live-trap, we were buoyed with optimism. For a day, or maybe two. But then several days went by with no activity in or out of the trap. And then a few more days went by. Our shoulders, collectively, sagged. Everything was so quiet. We had started picking a different rooster every night with which to bait the trap , but even a small, crowing, presumably tasty little rooster hadn’t tempted the Dreaded Varmint back into the chicken yard. There had been no new dead chickens lying about, thank goodness, but it seemed almost as if the unthinkable had finally happened . . . had the Dreaded Varmint, indeed, moved on? One morning after I had decided that this was probably the case, I set foot out the back door, hands full of buckets of kitchen refuse for the chickens. That’s when I heard it: something was scrapping about in the live trap. I could hear the door of the trap rattling and shaking. I froze in my tracks. We had caught something. Finally. I dropped my buckets and dashed back into the house, to grab my camera and the baseball bat (just in case). The kids were still asleep and Bryan was in the shower, so I would have to face the (probable) Dreaded Varmint on my own. I mustered up as much Prairie Woman Gutsiness as I could. I was feeling a mixture of excitement mingled with pure terror. At last–our patient, diligent and obsessive (some might say) trap-baiting, coop-fortifying strategies had borne fruit. The most formidable predator we’d ever run up against (and we had run up against a few!) was this Dreaded Varmint. We had him. I hoped. As I hurried out the back door, I could hear Steve Brody, the little rooster that we had baited the trap with the night before (no harm was done to him, Gentle Readers, and if you’d like the explanation of this to sleep well tonight, just see this) squawking his alarm. I hurried across the yard and through the trees, anxious to see what we had trapped. All these months of suspense and frustration–finally over! I could hear it better now–scratching, scraping, rattling, . . . whining? Was that whining I heard? Surely . . . . not . . . oh please . . . I approached the trap, still wary. We had piled branches on the trap to camouflage it, and I couldn’t see the varmint clearly, but I did see dark fur . . .wait a minute . . . white fur, too . . . a lolling tongue . . . doggonit! We had caught our own Bea in the live trap! Oh, Bea. You can open any door–but not this one. And stop grinning. It’s not funny. Terrific. Our ornery Australian Shepherd is an escape artist and she can open any door in our place, except for her own kennel door. And now, obviously, the door of the live-trap. I felt weak with disappointment and I dropped my bat. We hadn’t caught the Dreaded Varmint at all . . . we had only caught our own little dog. Fooey. Worse, I had the oddest feeling that the varmint was still watching me from the safety of the corn growing around our place. Chuckling in an evil way, undoubtedly. “Better luck next time,” Bea seemed to say, as she winked at me through the bars on the cage.